This is a three season, day-long paddle trip with an annual highlight of "lily season" which lasts from May to June. The Cahaba is the longest free flowing river in the state of Alabama and is considered one of the most biologically diverse in the nation. The river is home to 131 species of fish, 18 of which are found nowhere else on the planet. The flora is almost as diverse, but the shining star of this waterway, and what makes this paddling trip a must-do, is the beautiful Cahaba Lily. The remaining stands of this aquatic flower are found in only three states, despite having been widespread across the southeast in years past. Your spring paddling trip will be nothing short of a grand, fragrant show featuring clusters snowy white blooms. 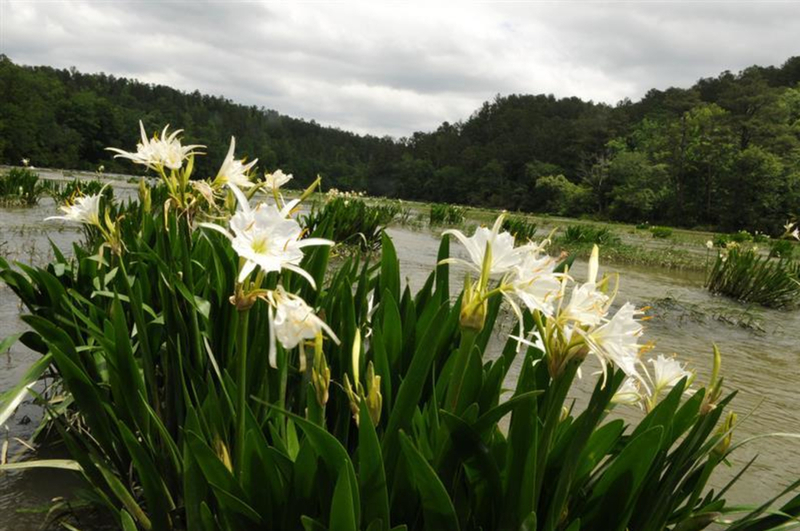 The Cahaba River is home to a quarter of the rare Cahaba Lily. Blooming during a short window from mid-May through June, the brilliant white flowers of the lily cover the shallow shoals from shore to shore for one spectacular month of the year. Unfortunately, if the trend continues with the rapid decline of habitat for these flowers, the opportunity to witness their spectacular blooms won’t be available forever, so we encourage folks to see them while they can. The best time of day to view the flowers is right as they open in the evening, preparing to be pollinated by the nocturnal Sphinx Moth. The details of a self-guided tour can be found below, but if the logistics sound overwhelming, join one of the many guided trips run by the Cahaba River Society. Let them do all the planning for you, including providing the gear and a shuttle from the take-out back to your car at the put-in. The cost is $20, but call in advance to reserve a space, as these trips fill up. They also run trips the rest of the year, like a moonlight river paddle, oxbow lake adventure and an overnight trip. A complete list can be found on the calendar on their website. Keep in mind that even though this trip is listed as a flat-water paddle, this section of river does have flow and some shallow rapids. You'll want to make sure your paddling skills and river experience are sufficient to safely navigate your canoe down the river. The three shoals where the lilies live present the biggest challenges to navigate, and it’s best to stay river-left for the first two small drops and river-right for the third. This section is classified as Class I-II during normal water flow, but is considered a Class III+ run when the water is high. Most of the time, though, you’ll need to wear shoes that can get wet, as the only way to navigate the shoals is to get out and walk the boat through the shallow water. 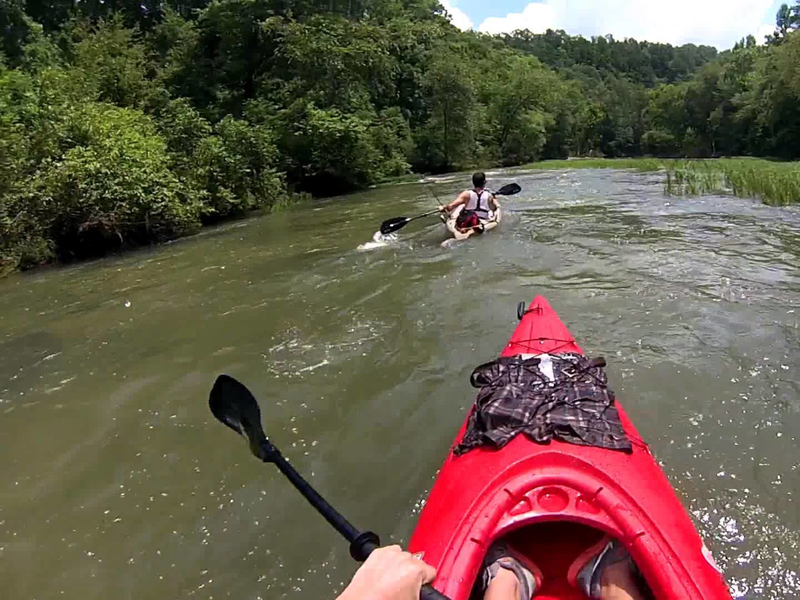 A self-guided trip can be done by renting a canoe from the Outdoor Rec Department at UAB in downtown Birmingham. All other logistics (boat transportation, vehicle shuttle, navigation, etc.) are up to you. Daily rental packages (boat, PFDs, paddles, straps) are available for $25 to $40 and you should definitely call ahead (205-996-4913) to reserve a boat, since this is a very popular trip during lily season. Once you have your equipment, set up a vehicle shuttle by parking a car at the River Bend Road (County Road 26) bridge south of West Blocton, Ala. Then drive to your put-in, which is the Cahaba River Drive (County Road 24) bridge east of West Blocton. 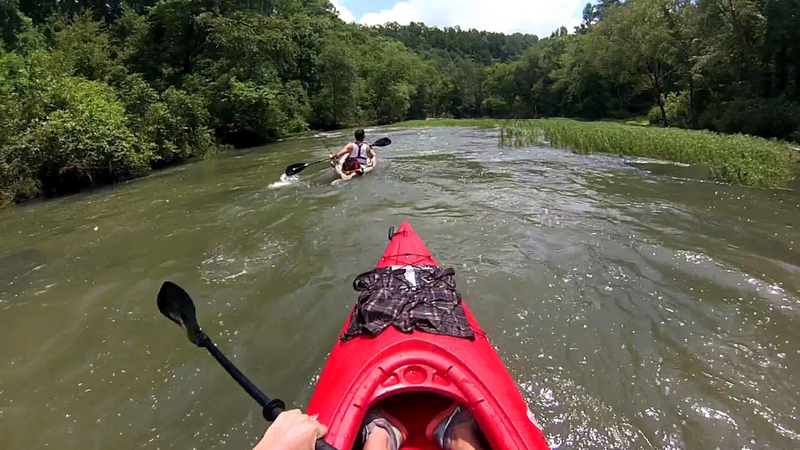 This will give you a 7-mile paddle back to your car. © 2019 RootsRated, Inc. All rights reserved.